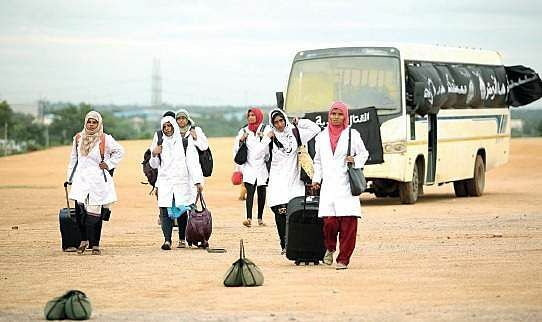 In war-torn Tikrit, the survival of a few Malayali nurses is suddenly at stake. Editor-turned-director Mahesh Narayanan’s Take Off is as raw as it gets. Based on an incident in 2014 when Malayali nurses were rescued from the Tikrit Teaching Hospital in Iraq, the movie is a fictionalised account of the struggle they faced to stay alive. Despite the cinematic liberties he took in making Take Off, which hits the theatres next week, Mahesh talks about how he strived hard to bring their ordeal on screen, undiluted. I was intrigued by the subject ever since I read about it. The media had already given extensive coverage, but still I wanted to meet the nurses in person. At that time, I wasn’t sure about making the movie. But, their struggle touched me. The nurses hail from middle-class families and their aim was to survive. Luxury figured nowhere in their lives. Even while in Iraq, they didn’t have any contact with the outside world. The saddest part is that even after reaching their homes safely, they haven’t managed to get employed. Then, I knew I needed to tell the world about their struggle. Take off is based on real-life incidents, but I have taken some creative liberties. The story and the characters have been fictionalised. Fahad Faazil’s character was inspired by Ajay Kumar, who was India’s ambassador to Iraq at that time. We have taken inputs from the decisions he made during that critical time. However, there were reports that not all the Indians who were stranded in Iraq could make it back safe. There were many speculations regarding this, but the Ministry of External Affairs was not transparent enough. While Fahad Faazil plays the Indian Ambassador, Parvathy and Kunchacko Boban play nurses who are stranded in Iraq. They have given some intense performances and it is the audience who will rate it. I am sure that we have given our 100 per cent for the movie by retaining its realistic flavour and not adding the usual cinematic elements.